GIVE WILDFLOWERS A GO ! You can still sow your wildflower seed in late autumn which is great. Native wildflowers are hardy and the roots will also be busy getting established so that come spring they’ll be ready to go. In pots, plots, garden borders or fields, wildflowers are a beautiful way to showcase nature right in your own garden. You are also providing a habitat to attract the bees and butterflies which is an added bonus. Which wildflowers should I pick? Check your soil and pick seeds that will grow well in your type of soil and site. Use UK native wildflowers like all our mixtures at The Grass People! 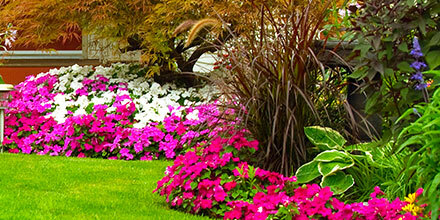 An area of typical soil that does not fall into the categories of Shady, Heavy or Sandy Soils. Bees & Pollinators Wildflower Seeds - Specifically selected for its attraction and benefit to both bees and butterflies – click here. Annuals Mix Wildflower Seeds - A vibrant display of annual wildflowers - click here. Flowering Meadow Wildflower Seeds - An attractive mixture of annual and perennial wildflower species and grasses – click here. An area where there is less sun, under trees or in shade from fences or buildings. Shaded Areas Wildflowers - A mixture of annual and perennial wildflower species and grasses suited to areas of dappled shade caused by trees or overhanging structures – click here. Areas where the soil is like clay and clumps together. Heavy Clay Soils Wildflowers - A mixture of wildflowers and grass suited to heavier soils – click here. Free draining loose type soil areas. Sandy Soils Wildflowers - A mixture of wildflowers and grasses that can withstand drought conditions and are commonly found colonising light soils – click here. Ideal spot is an open sunny area but there are mixtures to suit all areas. If you are sowing a small area you can clear weeds by hand and dig them out good and proper as they will compete with and outgrow your seedlings. If it’s a large area kill off coarse leaved grasses and weeds with appropriate spray. Dig over the soil and lightly rake to create a fine-ish surface, no big lumps or stones. TIP: Mix the seeds with sand to help disperse them evenly. Scatter the seeds over the area or in rows, give them enough room to grow. Carefully rake and then water. Keep an eye out for new weeds coming up and slugs that may be around while it’s still warm enough.